16 cm long (6 inches). 12 cm tall. 10 cm depth. 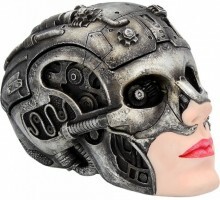 Robotic android female skull box. It's not obvious that the 1kg approx skull comes apart so a great place to store valuables.